It was certainly not because the SU-24 posed any threat. The plane is old and slow, and the Russians were careful not to arm it with anti-aircraft missiles. It was not because the Turks are quick on the trigger. Three years ago Turkish President Recep Tayyip Erdoğan said, “A short-term violation of airspace can never be a pretext for an attack.” And there are some doubts about whether the Russian plane ever crossed into Turkey’s airspace. The U.S., France and Great Britain are also trying to overthrow Assad, but are currently focused on fighting the IS using the Kurds as their major allies—specifically the Syrian Kurdish Democratic Party, an offshoot of the Kurdish Workers Party that the U.S. officially designates as “terrorist.” These are the same Kurds that the Turks are bombing and who have a friendly alliance with the Russians. Indeed, Turkey may discover that one of the price tags for shooting down that SU-24 is the sudden appearance of new Russian weapons for the Kurds, some of which will be aimed at the Turks. The first of these developments has been building throughout the summer: a growing flood of Syrians fleeing the war. There are already almost two million in Turkey, and over a million in Jordan and Lebanon, and as many as 900,000 in Europe. Out of 23 million Syrians, some 11 million have been displaced by the war, and the Europeans are worried that many of those 11 million people will end up camping out on the banks of the Seine and the Rhine. If the war continues into next year, that is a pretty accurate assessment. Turkey and Saudi Arabia are adamant that Assad must go, but neither of them is in the driver’s seat these days. While NATO supported Turkey in the Russian plane incident, according to some of the Turkish press many of its leading officials consider Erdoğan a loose cannon. And Saudi Arabia—whose economy has been hard hit by the worldwide fall in oil prices—is preoccupied by its Yemen war that is turning into a very expensive quagmire. The second development is the Russian intervention, which appears to havechanged things on the ground, at least in the north, where Assad’s forces were being hard pressed by the Conquest Army. New weapons and airpower have dented a rebel offensive and resulted in some gains in the government’s battle for Syria’s largest city, Aleppo. The Bayirbucak area and the city of Jarabulus are also the exit point for Turkey’s lucrative oil smuggling operation, apparently overseen by Erdoğan’s son, Bilal. The Russians have embarrassed the Turks by publishing satellite photos showing miles of tanker trucks picking up oil from IS-controlled wells and shipping it through Turkey’s southern border with Syria. 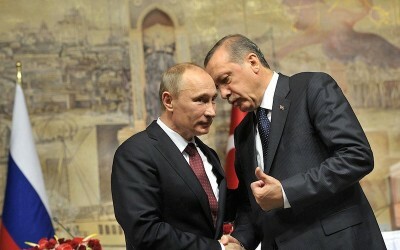 Erdoğan did not get quite the response he wanted from NATO following the shooting down of the SU-24. While the military alliance backed Turkey’s defense of its “sovereignty,” NATO then called for a peaceful resolution and de-escalation of the whole matter.